Lulu is a beautiful, 9-year-old red fawn female born May 2003, and she is tattooed as the "D" pup Her registration number is illegible, so Lulu’s true identity will never be known. 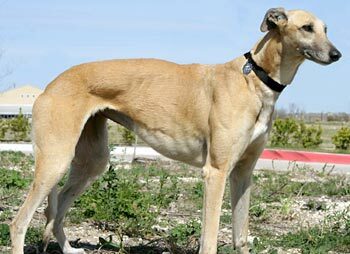 GALT originally received Lulu from the Waco Shelter, through the help and assistance of the Texas Greyhound Association. 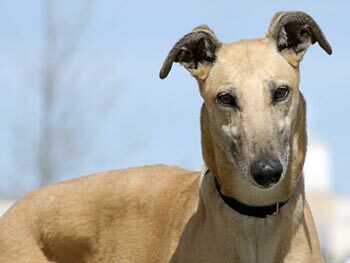 She was in a home for three years, but has since returned to GALT through no fault of her own. Lulu is not cat tolerant, but has not yet been tested with small dogs. Lulu is a very affectionate little lady who loves to play! She adores all people, children and other dogs, and enjoys her stuffies too, especially when they squeak. She is currently infatuated with a hot pink flamingo and the occassional slipper. She doesn't destroy anything, just likes to toss her toys in the air and catch them! Lulu loves car rides, but has figured out that if she doesn't jump into the back of foster mom's SUV, then she will be lifted in. She is one smart little girl! Lulu is not a total Velcro dog, but will occasionally check up on your whereabouts. When walking, she does like to feel your leg against her shoulder and your hand on her head. She is very sweet and gentle -- loves to just look at you with those huge brown eyes and listen to you tell her how wonderful she is! Lulu is a true lady who enjoys all the pampering you will give her! She loves having her ears cleaned, doesn't mind tooth-brushing or nail clipping, and will not move a muscle as long as you are brushing her hair. She loves it all! She does have a protective streak; Lulu will let you know when someone is at the door, but responds to "no bark" perfectly. If she hears something odd in the back yard, she will run out the dog door to investigate. It's as if she thinks she's in charge of security! Lulu is sweet, calm and loving. She would do fine with other dogs, or as an only dog. 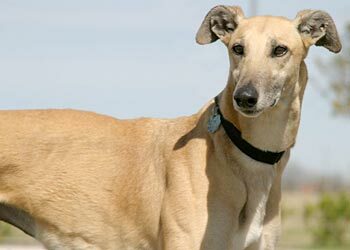 She is very easy to love and care for and will make a fine addition to any family who will love her as much as she will love them. Come meet Lulu! She's waiting to meet you!